About three weeks ago, I awoke from a nap to find that my roof was leaking. I went outside and climbed the ladder and as I looked for the leak, it began to thunder and lighting. My wife stepped outside and suggested I come down and went to hold the ladder. I was way ahead of her on that idea and went to get on ladder before she had took hold of it. As I placed my feet on the ladder, I recall very vividly seeing the ladder slide at the bottom and me trying to leap unsuccessfully back on the roof. The next thing I saw was myself laying on my concrete patio having fallen ten to twelve feet. My wife as expected was a bit hysterical and my two girls were not far behind her as they worried too about their dad. As the rain increased to what felt to me like a torrential downpour, I laid there having hit my head on concrete and felt great deal of pain in my lower left hip and my left arm. My dear wife asked if I could move and I then realized that I had broken my arm. The paramedics were called and I was transported by ambulance to the local emergency room. I am thankful and amazed that I remain here. 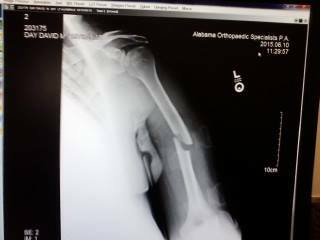 After all the x-rays, the only damage was a broken humerus to my left arm ( That’s the bone between the elbow and shoulder). But I rejoice in all of this as I know that God is completely sovereign over all things. That His word stands true even in the midst of our greatest afflictions. Romans 8:28 attest to this. “And we know that God causes all things to work together for good to those who love God, to those who are called according to His purpose. The Lord has shown and taught me so much love and compassion, patience, and humility by allowing this one act of mercy to occur to me. I understand that many people die from falls just six feet from the ground, yet I fell ten to twelve feet onto a concrete patio and did not burst my head open. That I could have too broken my back or be paralyzed. The greatest thing He showed me was what a great wife He has given me. My dear wife has for the past few weeks went without sleep, fed me, bathed me, dressed me, nursed my wombs, and has transported me to the doctor and everywhere else I needed to go. She has done all of this too without one complaint. I wonder why this women loves me of all people so much to do all of this. I am so unworthy. God’s word again rings true, “He who finds a wife finds a good thing And obtains favor from the LORD.” Proverbs 18:22. This though is a picture of Christ who laid down His life, not for good men or because we somehow deserved it. He did so because He loved us. Again, how myself and all of us are unworthy. 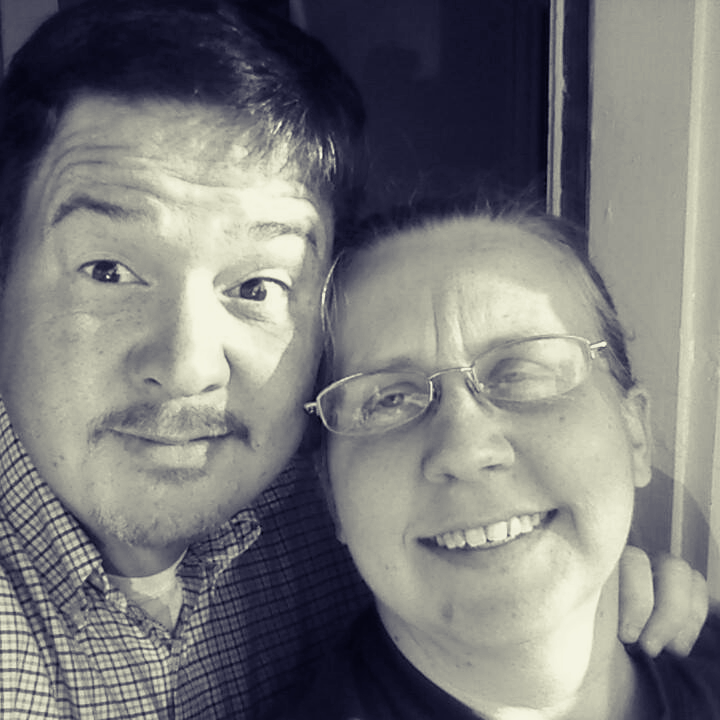 I want to express, I indeed found favor from the Lord with my Amanda, as she is the best wife one could ask for. Therefore take up the whole armor of God, that you may be able to withstand in the evil day, and having done all, to stand” (Ephesians 6:13). The Holy Scriptures assures us that we have come into the Kingdom for such a time as this. Yes, we are the people, Montgomery, AL is the place, and the appointed time is July 11-18, 2015. During this appointed time, the salt will come out of the shaker and the light from under the bushel to love God and our neighbor as ourselves. There will be street activities each day and every night anointed rallies. Operation Save America is bringing experts in their field to address the battle for the souls of men, the lives of children, and the future of our nation. With all dispatch, we ask you to seek the Lord, fast, pray, and plan on joining us to make a stand for our King and the little ones made in His image in Jesus’ name! Go to our facebook page by following this link. There you can share that you are going or at least you will try to make it. Hope to see you there in Jesus’ name. A few months ago my wife beg an selling beauty products and hosting at-home spas at our house as well as her friend’s home’s. During these spas, My wife would share with them some of the products she represents and they all would try them out among enjoying some snacks and fellowship. Her goal was not just making an extra few dollars but introducing her friends and other people to the product that she enjoys using as well as telling others about. I have seen many products that people offer that they claim can change your life or make you rich; give you happiness and a fulfilled life. Unfortunately, many do not offer what they profess to and are just gimmicks to get them rich. But what is worth really telling people about?